This campaign was created by Zoe Blake, The Friendly Pet Nurse, to raise awareness around the importance while dog walking, of good lead etiquette. You may already have heard of the Yellow Dog UK campaign, a charity raising awareness for dogs that may be being rehabilitated, recovering from surgery, or while training to give them space when out walking. 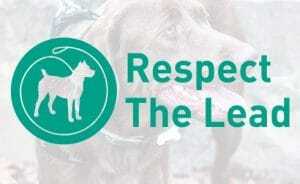 Respect the Lead takes this understanding a step further, and suggests that we need to spread the word, particularly to other dog owners, that sometimes dogs are walked on the lead for a certain reason and that their dogs need to interact in a safe and happy way with other canines. Not all dog owners understand the importance of supervising your dog when they meet others in the park or on their daily walks. While your own dog may be very pleased to meet another pooch, this isn’t always the case for other dogs and their owners. Some dogs can be very nervous when around other dogs. Perhaps your dog is really friendly, has never shown any signs of aggression, but he may still react when on the lead. He may bark and lunge at other dogs as a way to protect himself, and of course, if your dog doesn’t react in this way, the dog he is meeting may well do. When out with your dog and he is off the lead, you may see another dog owner approaching with their dog on the lead, prevent your dog from rushing over and recall them immediately. Then either re-route your dog to avoid any contact, or place your pet on his lead. If the other dog owner expresses any concern to you and asks that you keep your dog away from theirs, please respect their wishes. Keep your dog close to you and do not allow them to approach their dog. Remember that not all dogs are friendly when they are on the leash – expect them to lash out if you approach them. When walking your dog on the leash, remember that not every pet owner appreciates a distraction while walking their own dog. Don’t allow your dog to approach another dog on the lead, without first asking permission from its owner. Remember to use the “3 second rule” – allow your dog to introduce themselves and take a sniff, but then pull them away after 3 second, maintaining a very brief meeting. Always keep your dog on the lead if you do not have a very reliable recall. You may need to train your dog to walk on the lead, alongside you, but it’s a responsible dog owner that always keeps their dog leashed, unless of course that there is a nominated area where dogs are allowed to run off the lead. While your dog may be perfectly well behaved and a social butterfly, you do not know the same of every other dog that you encounter. Of course, seeing a dog galloping towards them may make other dogs, and their owners, anxious or nervous, so do them a kindness, be considerate and keep your dog on the lead. As a responsible dog owner, always respect an unknown dog’s state of mind. When walking your dog remember that you are an ambassador for dog owners and a protector for your pet, promoting safe and responsible behaviour all around. Know the Law – Poop Scooping!